Tapsalteerie Press is one of only a very small handful of Scots language imprints in Scotland. Founded & run by Duncan Lockerbie far away from the central belt in Aberdeenshire, they’ve been producing quality pamphlets of Scots (& occasionally Gaelic & English) poetry & prose pamphlets since a crowdfunding campaign saw them start off in 2013. Despite little to no official funding, they go from strength to strength in terms of the writing & production quality of their publications, as with recent collections from young Glasgow writer Kate Tough & their ‘Biggin Brigs’ series of collaborative Scots/Gaelic/English poems. Nae Flooers (Ann McKinnon) & Scottish Spleen (various) both appeared a couple of years ago & make for fascinating, worthwhile examples of the (perhaps surprising to some) wide variety of approach, language & subject employed by writers in Scots today. As well as McKinnon’s creative responses to both the landscapes of her native Fife & those of her ancestors in the western isles, there are poems on subjects ranging from Philip Larkin (‘he hid the selfsame clanjamfrie/that hauds us aw tae life’), the Forth Road Bridge’s 1964 opening & the awful fire which almost destroyed Glasgow School of Art. Such diversity in Scots is welcome, with McKinnon, now among many others, showing that Scots is a language not just for literary exercises on biscuit tin subjects. Hopefully, as time progresses, it can also become not just a language of poetry but of media, more novels & drama, TV, Scottish daily life itself. 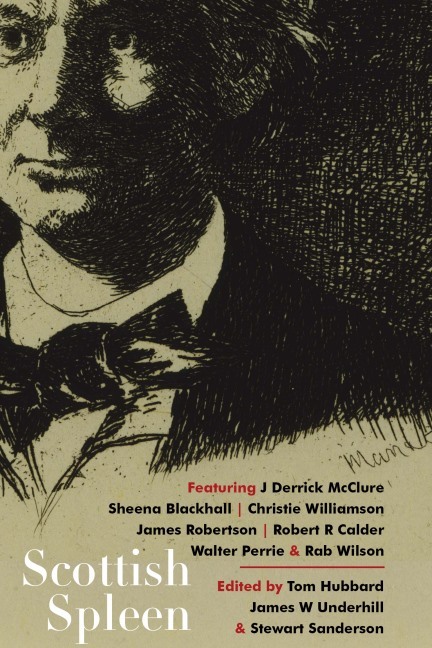 Scottish Spleen is a collection of creative responses to & translations of Baudelaire’s Le Spleen de Paris, the ‘first literary work to identify itself as prose-poetry. Edited by Tom Hubbard, Stewart Sanderson & James W. Underhill, it features work from nine, mainly well-known writers & activists in the Scots language field. I noted immediately that only one contributor was female (the celebrated Doric scriever Sheena Blackhall) & most won’t see 50 again. That said, this is an enjoyable mixter-maxter of both subject & Scots. I’ve not read the original, but as Underhill says in his (helpfully expansive & robust) intro, on both the differences in translation into Scots & English, & this publication’s raison d’etre, ‘Making Baudelaire Scots….Our versions are echoes offered as a bit of fun. It’s all about masquerading. Guising.’ And this refers, too, I feel, to the different Scots byleids used throughout, from Blackhall’s timelessly authentic & fluent Doric, to Rab Wilson’s semi-Burnsian Lallans to what Underhill calls his own Glaswegian/Borders hybrid. Derrick McClure displays his own wonderfully rich Scots lexicon in ‘Winnocks’ – ‘Whit recks the truith at’s furth o me, gin it it helps me tae leive, tae feel at I am, an whit I am?’). A bit of fun right enough but with a joyous depth to both language & response that stands up to several readings. Tom Hubbard writes, in his preface, of how ‘Baudelaire seems to appeal to a Scottish sensibility of grotesque Gothicity…’ & days how the title pretty much suggested itself. There is indeed a snarl & cocking of the snook in more than a few pieces, but there’s also a good, pawkie dose of humour, couthily, easily owreset into Scots, such as in James Robertson’s A Jampher or Hubbard’s The Dug and the Scent-Bottle, where we Scots ourselves get a poke in the eye. Scots orthographic & standardisation debates aside, the strength of the writing here’s in its attitude as a language equal to any other, one which can easily accommodate not only one writer, Baudelaire, but any facet of life, disgruntled or celebratory, you care to mention. Tapsalteerie is to be congratulated for tethering so many different craturs in its still relatively new stable.